The ecological characteristics that make the Great Salt Lake unique also create management challenges. 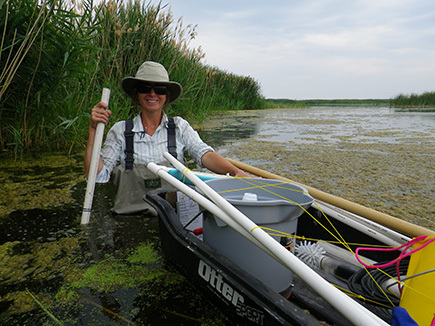 Because water-quality criteria designed to protect beneficial uses in other waterbodies aren’t necessarily applicable to the lake, Division of Water Quality (DWQ) scientists need site-specific data to determine the potential impacts of existing or proposed pollutant inputs to the lake’s water quality and overall ecosystem. Clearly defined water-quality goals ensure that regulatory decisions protect the lake’s vibrant ecology, beneficial uses, and economic activities. The Great Salt Lake Water Quality Strategy, completed in 2014 after two years of DWQ development and stakeholder input, provides a roadmap for lake management and balanced decision-making on issues affecting the lake. Utah protects waterbodies for their designated uses, such as recreation and wildlife use, including aquatic life that support this wildlife. The designated uses for the Great Salt Lake (a Class V waterbody) are divided into five subclasses (5A, 5B, 5C, 5D, and 5E) to reflect the different salinity and hydrological regimes in the lakes as well as the unique ecosystems associated with each of the four major bays and their adjacent wetlands. Since salinity is the driving force behind the ecological balance of the lake, the water-quality strategy relies on categories of salinity (freshwater to hypersaline) rather than geographical boundaries. DWQ employs a number of scientific and regulatory tools to protect the water quality of the Great Salt Lake. Narrative and numeric water-quality criteria for the lake identify specific water-quality objectives to ensure it meets its designated uses. Utah Pollution Discharge Elimination System (UPDES) permits establish allowable concentrations/ loads of pollutants/discharges into the lake to protect designated uses and comply with Utah’s anti-degradation policy for state waters. The Great Salt Lake Water Quality Strategy supports the development of numeric water quality criteria to protect designated uses for aquatic life and recreation, improvements to water-quality monitoring, prioritization of research, Implementation of a plan to monitor and assess the water quality of the lake’s wetlands, and implementation of a plan to assess nutrients. The strategy also includes practical steps for better coordination and communication with key partners and stakeholders. Enhanced knowledge from the implementation of the strategy will help DWQ develop appropriate water-quality protections to ensure the lake continues to benefit Utah citizens now and in the future.